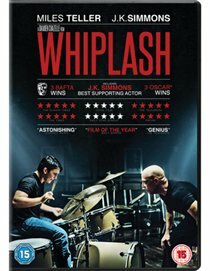 Miles Teller and J.K Simmons star in this Academy Award-winning drama written and directed by Damien Chazelle. Miles Teller and J.K Simmons star in this Academy Award-winning drama written and directed by Damien Chazelle. With a promising career as a drummer ahead of him, Andrew (Teller) enrols at one of the most prestigious music conservatories in America to try to hone in his skills and perfect his ability. When he meets Terence Fletcher (Simmons), the notoriously harsh band leader at the school, he begins to doubt his talent as Fletcher takes every opportunity to belittle and humiliate his newest pupil. The cast also includes Paul Reiser, Melissa Benoist and Austin Stowell. Simmons won a Golden Globe, a BAFTA and an Academy Award for his performance. The film was also nominated for a further four Academy Awards including Best Picture and Best Adapted Screenplay. With a promising career as a drummer ahead of him, Andrew (Teller) enrols at one of the most prestigious music conservatories in America to try to hone in his skills and perfect his ability. When he meets Terence Fletcher (Simmons), the notoriously harsh band leader at the school, he begins to doubt his talent as Fletcher takes every opportunity to belittle and humiliate his newest pupil. The cast also includes Paul Reiser, Melissa Benoist and Austin Stowell. Simmons won a Golden Globe, a BAFTA and an Academy Award for his performance. The film was also nominated for a further four Academy Awards including Best Picture and Best Adapted Screenplay.